App necessary to access Splatoon 2's SplatNet 2. The online app for Switch is now available on the App Store for iOS and Google Play for Android devices. The app will “enhance your online gameplay experience” on Switch, and allow access to game-specific services, such as SplatNet 2 for Splatoon 2, in order to invite friends to play via social media, and use voice chat while playing. The Nintendo Switch Online app is designed to help enhance your online gameplay experience on Nintendo Switch. 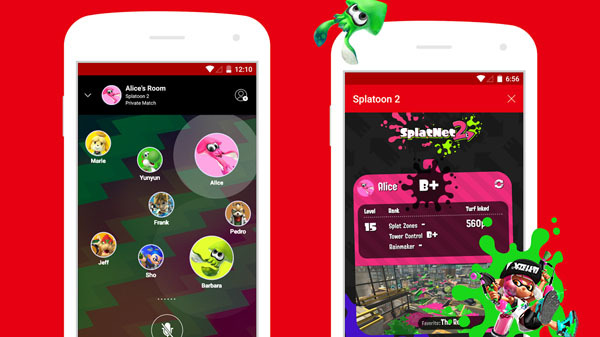 With this app, you can check game-specific services (e.g., SplatNet 2 for Splatoon 2), invite friends to play with you via social media, and use voice chat while gaming. ◆ Do you play Splatoon 2? If so, you can make use of the dedicated SplatNet 2 service! You can use SplatNet 2 to check all sorts of vital battle-related information, including match results, stages, and rankings! You can invite friends to play with you in supported games via social media such as Facebook and Twitter. Of course, you can easily invite your Nintendo Switch friends, too! You can enjoy voice chat in different ways depending on the type of game you’re playing. Chat with everyone in your room or split voice chat into teams and have it out head-to-head! *In order to use these services, a Nintendo Switch game compatible with this app is required. Splatoon 2 is compatible with this app. You can use the Nintendo Switch Online app for free until the paid subscription service launches in 2018. A Nintendo Switch console, a Nintendo Account, and supported game are required. Your use of this app is subject to the Nintendo Account User Agreement, available at support.nintendo.com.